But this year, I wanted something different for Christmas so thought I would do a ‘trial’ and fry a turkey. It was almost too easy; it was most definitely delish! 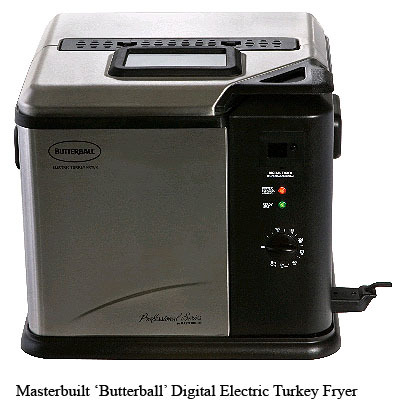 I had received this Masterbuilt Indoor Turkey Fryer from the folks at Masterbuilt and I was anxious to try it out. Yes, I said indoor. My only previous experience with fried turkey was several years ago when my family went with friends to visit their relatives that lived near Pikes Peak. They had a propane fryer and it was positioned far from the house at the end of a driveway to avoid the dreaded incidence of ‘burning the house down.’ Knowing that each year several people lose their homes when deciding to fry turkey I naturally had some anxiety. There was no need; this unit has everything contained inside an electric model that eliminates the worry about flames meeting oil and house meeting doom. The optimum size for a turkey for this unit is about 12 pounds. I was lucky to score a couple of fresh turkeys this year and since I did not have to wait days for them to thaw, I decided to brine the turkey the night before I planned to fry it. I came up with my own take using these two brines from Jenn Cuisine and The Pioneer Woman; mine was a combination of all apple cider per Jenn and some additional herbs and spices ala Ree. I had never brined a turkey before but was game to try and must say the combination of brining and frying was easy and the results were fabulous. I used a small cooler for the overnight brining since my fridge does not have the room. Making sure it was thoroughly clean, I dumped several inches of ice in the bottom of the cooler followed by the turkey and then more ice to cover. I poured the cooled brine on top of the ice and put the cooler in the garage. It was perfect; that there was still some ice the next morning assured me it has stayed cool enough and a simple rinse and dry and it was ready to go. The frying part? Easy beyond belief. I used peanut oil for the fryer; it’s the one recommended by Masterbuilt. Once the oil was hot, the turkey is immersed in it and voila…a finished turkey in 44 minutes. Let me repeat that. FORTY-FOUR MINUTES!!! Though it was juicy and succulent, I decided to make a glaze that John McLemore, the owner of Masterbuilt, includes in his book, ‘Dadgum That’s Good’ with recipes for not just fried turkey but barbecue, smoking, grilling, boiling and steaming. It was not your standard Thanksgiving seasonings and I liked that; I don’t like to replicate the flavors from one holiday to the next. The glaze with roasted pecans in honey was SO good and yes, true to form I might have put a nip of bourbon in there. I do have a reputation to keep you know and it did seem perfect for a Christmas turkey. Fried and boozy…oh yes! I’ll be serving it with some Cosmopolitan Cranberry Sauce and simple baked sweet potatoes seasoned with Sage and Caramelized Shallots Compound Butter. Easy and yum it is! See that pretty serving platter? My Grandma Lizette Bathe gave that to me many, many years ago. She was in her 90’s and starting to show signs of Alzheimer’s and I think she must have known that plans were in the works to move her into a care facility. When we were kids, my Grandma and Grandpa lived about 45 minutes from us so we just saw them irregularly. When I was 22 I moved into a small single bedroom home that was just minutes from her (my Grandfather died many years before she did) and that turned out to be the best move ever. I would visit her every Sunday afternoon and sometimes take her out to dinner during the week too. My Grandma was then and remains for me today the epitome of sweetness; I never heard her lose her temper and she was so very special to me. No matter the time of day, when I walked in her front door it was always the same question, ‘Are you hungry Barbie?’ And she always had something good to eat in her fridge! She insisted that I take this serving platter and a matching gravy boat because she wanted to make sure I had something of hers. I’m so glad she did. I know she would love this turkey…as long as I had a beer for her on the side! Fried turkey is topped with a fabulous pecan, honey and bourbon glaze. Prepare and cook according to manufacturers directions for your appliance making sure it is cooked to an internal temperature of 165 degrees.I used peanut oil and an almost 12 pound turkey seasoned very lightly with a spice rub especially for fried poultry. Once the turkey is fully cooked; allow it to drain in accordance with manufacturer's directions and then let cool for 20-25 minutes. Spread the pecans in a single layer on a baking sheet. Bake for 8 minutes or until lightly browned. remove from the oven, let cool and chop coarsely. In a small saucepan over medium-high heat, combine the honey and butter. Once combined, stir in the chopped pecans and bourbon if using and cook for 8 minutes to infuse the flavors. Remove the glaze from the heat and keep warm. Carve turkey, place on serving plate and pour glaze over the meat, passing the glaze as necessary. Cook time does not include time for overnight brining. I brined mine for approximately 18 hours. This is a sponsored post for Masterbuilt but all commentary is my own. I just purchased a Masterbuilt turkey fryer for this year’s bird. I can’t wait to use it. I’m glad to hear you say it’s incredibly easy to use. Love that glaze too. May have to use it on one of the birds! Thanks for the recipe! I had never tried fried turkey until I met my wife and was invited to her house for Thanksgiving (back in the 90’s). Her father was frying a turkey using the propane open flame method. I was worried the whole time about not hurting anyone’s feelings when I bit into a soggy oily mess of bird. What a shock. Long story short, fried turkey is all I eat now and the thought of getting to cook one indoors…thanks ya’ll! I too have cooked the turkey with the bag of giblets still inside. It’s not funny until years later. First time I bought a turkey, I didn’t realize it needed to thaw for DAYS, so it wasn’t ready in time for Thanksgiving. We just had it a couple days later. Was an informal thanksgiving, so not a big deal. Still funny to think about though! My family always had a deep fried turkey along with a traditional turkey at both thanksgiving and Christmas. I have an outdoor fryer, but it is hard to do in New England in the winter. My wife (who grew up in California) generously agreed to fry a turkey for friends in January. I had to put a stop to that! Who is going to stand out there and watch while standing in a foot of snow? If I had an indoor fryer I could fulfill her obligation. My first Thanksgiving being married was a difficult. I had no idea how to make the turkey and it ended up being pink inside and we just went to his moms for thanksgiving. I made a turkey for Christmas and learned to leave the turkey in there for a few more hours and not to always go by what the time says cause my oven at that time wasn’t the best. That Christmas turkey turned out great and never had a problem with turkeys after that. There are no funny turkey stories. In fact, I have to say that most Thanksgiving birds have been pretty consistent over the years, although looking back, I suppose my mom and grandmother pretty much did them in after starting the roasting at 4 am for a 3 pm dinner! Subscribed to email too. Thanks! Following both and tweeted the link. How about a live turkey story? I was by the huge turkey corral at the farm I work with when I noticed one of the birds had gotten through the fence. It’s rare, but it happens. The bird wasn’t wandering off, it was trying to get back inside with the other 99 turkeys, but it couldn’t figure out how. Feeling bad for this poor, lone turkey I tried to guide him back through the gate. Needless to say, guiding a turkey is pretty fruitless. I did manage to get it inside the corral after about 15 minutes though! This was my first year hosting Thanksgiving for my family and I was so nervous! I decided to get a fresh organic turkey through my CSA and chose a simple herb and butter preparation. It was delicious and a ton of fun cooking for everyone. I would love to serve up a fried turkey next year! My most memorable turkey story occurred about 6 years ago. I was hosting T-day for my family – parents, grandmother, sister’s family. Living in the midwest, an ice storm knocked out power to our kitchen electrics mid-cooking. My husband was on staff at church and so I carefully drove the icy streets to borrow one of the church’s many counter-top roasters (on hand for potlucks). I actually grabbed a few, not being sure if they actually functioned. The turkey finished cooking in the roaster and was still quite tasty. Dinner just took a couple extra hours longer before all the food was ready! I’ve never deep fried a turkey, but I’ve heard they’re amazing! And with special touches like bourbon and pecans, oh my! I have only once in my life roasted an entire turkey myself, since I always go somewhere for Thanksgiving. BUT, I love turkey and have been thinking about roasting one so I can freeze the meat for later (something my mom always did). This fryer would be perfect 🙂 I wish I had a funny turkey story to tell, but, alas, I do not! Sixteen years ago when I first moved into this home, I had my Aunt and Uncle (who had hosted Thanksgiving in New Jersey my entire childhood) visit me and stay for Thanksgiving. My Aunt was known for setting a perfect table and having each entree served perfectly if you know what I mean. I was using a new oven, first time I roasted a Turkey in my new “old” home. Little did know, the oven temperature stat was way off. We had gone out to shop and the Turkey was set to be done (with my husband at home basting) when we returned. I took the Turkey out, started to trim and blood started to ooze out. Everyone was starving, complete disaster. Needless to say, I have completely redone my kitchen and outfitted with two new ovens–but my Aunt has never returned! I had company traveling from OK to TX where I lived at the time. I got up early to put the turkey in the oven. By mid day when the turkey was supposed to be done, it was bleeding red when I cut into it. I had misread the label, thinking I had bought a smaller weight turkey and was cooking it by the suggested temp for the required time for that weight. That was when my vision just started going. I dug the label out of the trash and sure enough, I had that big thing that really needed a couple more hours to complete roasting, it was 21 lbs. We put it back in the oven, ate what was cooked. Then we took off to the beach in Galveston. That was 1971. I tweeted, but I am don’t know what I am doing on there. I hope I did it right. I also signed up for your email. After living in the South for several years, when we moved here, I missed the deep fried turkeys that they fixed there. I bought the deep fryer created for outside and set it up to fry up our Thanksgiving turkey several years ago. I thought I had done everything right…measuring with water for the amount of peanut oil to put in it, etc. My husband and brother were in charge of frying it. First thing is they dropped it in too fast and grease splattered all over my deck! I’m so lucky that they didn’t create a fire. And although the turkey turned out fine, because of the mess and clean-up afterwards, it was the last time the fryer was ever used. I now watch with amusement as Alton Brown is pictured with some wooden trapeze and pulley mechanism to use one of those fryers. This Masterbuilt one looks so much simpler to use!!! Plus there is the advantage that I could be in charge of it this time if I were to win this. Bourbon and pecans…can’t get much more Southern than that! Now you have me longing for another deep fried turkey this year. When I was young my parents used to shop weekly at an urban market, for everything we ate. A stop at the butcher for meat, the bakery, the dairy, a banana store, the fish monger, and then to the poultry place where the owner would take you out in the back to select your bird, slaughter it, pluck it, singe it and wrap it in newspaper. When we got home my Dad would make a place to work on the kitchen counter and proceed to clean the still-warm bird. He was a great cook and would use almost every part for soup, stew, stuffing. My sister, brother and I were fascinated by this process. I don’t know if I was more disappointed or relieved that I didn’t have to do that job. Just enjoyed someone else’s fried turkey for Thanksgiving and now I am craving a fryer! Oh and finally…I follow CreativCulinary and now follow @masterbuilt and tweeted about the contest on both. I’m wondering if the fryer would work with goose too? Oh Barb, the turkey looks phenomenal. I was concerned about the inside fryer but it sounds like it worked out. Count me in as a contestant…I want the turkey fryer. I just tweeted about the giveaway. I followed you both and tweeted! I turkey story focuses on stuffing. Last year I had a huge fight with M because he cooked stuffing IN the bird. In my Dominican crazy mind, I thought this was the most dangerous thing to do (rumor mill stories) and I refused to eat it. I know learned that when correctly cooked, stuffing inside the bird is tasty. Just tweeted this fabulous giveaway! And I already follow both you and Masterbuilt. one thanksgiving i was getting everything going as far as cooking goes the night before. i had everything down pat. funny thing thought the cat decided i shouldn’t be cooking that and jumped up to the counter grabbed a hold of the leg a dragged the turkey outside through the pet hole. i wanted to kill that cat, but at the same time i couldn’t help but laugh because of the way it was done. needless to say i had to come up with something different. didn’t see that cat for a week. oh well. at least she had a good meal. As for my story, I’ll never forget. I was hosting both families at my house for Thanksgiving. I was cooking the night before as I usually do and toasting the breadcrumbs in the oven. But as the night went out, the crumbs seemed to not be toasting. My husband and I investigated and discovered the oven had stopped working. The night before Thanksgiving! Luckily we were able to get a guy out the next day to fix my oven and Thanksgiving went off without a hitch. But for about 12 hours, I was trying to figure out where in the world I would be able to roast my turkey. Otherwise we’d be having Chinese for dinner. Would LOVE this turkey fryer. I imagine there would be an immediate spike in poultry sales coming from this house! Have heard of so many converts! Once you fry…. My turkey horror story occurred about 4 years ago when I was cooking a ginourmous turkey for family and friends. Now, I’ve cooked many turkeys in my life (written a few too) but this was the turkey that would not die. No matter hat I did it just would not cook through. It hadn’t been frozen, it had rested in the fridge for several days before cooking but it just would not budge from nearly raw no matter how many hours I roasted it. I panicked. My brother in law (a Gulf War vet) finally solved the problem for me with army ingenuity by quietly coming into the kitchen hacking the turkey up (it was super big) and microwaving it. We never told anyone. I have not cooked a turkey since then as they frighten me too much and I am traumatized. Perhaps this device of a turkey fryer would break through my psychological block and cure me. I want this device. Do I have to beg? PS..I already follow you and get your email updates! I followed @masterbuilt & tweeted! Yum! You are soooo naughty! Dont tell but Dr. Food left the bag of gizzards in the bird this las T-Day. Pfff. Oh my god you are talking all sorts of wonderful in this recipe. Turkey…fried…butter….bourbon?! I would love to see this on my Xmas table!! And in 44 minutes?! What more could you want. I am glad you have your fryer under control, that can always be a bit nerve wracking I’m sure. Loved reading this post, though I have to admit that the thought of using 2 gallons of oil to fry something set me reeling. Guess I’m just not meant to be a “deep frying gal”. Wouldn’t mind being invited over for dinner though. I now want a turkey fryer. Hear that Santa? Between your picture, recipe, and 44 minutes, I’m sold! I REALLY want to fry our Christmas turkey… And after seeing your pictures, I want to even MORE!!!! Pecans and bourbon AND honey. Honestly, amazing! Even I couldn’t resist taking a bite of this magnificent bird! Oh my, that looks so incredibly good. Those roasted pecans send it right over the top! Just fill a tub with that glaze and let me bathe in it – I can deal with a few pecan ‘bumps’ – exfoliate. On second thought, just give me that whole platter of sliced turkey, dripping with the glaze. Most mouth-watering photo of sliced turkey I’ve ever seen. TOTALLY decadent looking and right up my alley- This is amazing! I am still trying to wrap my brain around the 44 minutes!!!! O M Gosh!!! Now I know what I want for Christmas – that deep fryer! This looks decadent! Wow! I am so impressed. I love your stories! That platter of your grandmother’s is beautiful and such of wonderful reminder of happy days for you. Your turkey looks amazing. I’ve had fried turkey once and it was delicious. This pecan glaze is perfect…sounds and looks divine. Oh my heavens! Can we just call this Divine Southern Turkey? MmmMmm…I’m passing this recipe on to pops. I have had, and loved every bite, deep fried turkey several times while living in the US. It would be unheard of here in Ireland. The first tiem I tried it I was sure it would taste greasy – all that oil, right? But wow…..it is one of the tastiest things I have ever tried and who can argue with a recipe that has Burbon in it? I will not buy a turkey fryer, I will not buy a turkey fryer, I. Will. Not. Buy. A. Turkey. Fryer. I’m starting to believe you are a bad influence on me with all of your beautiful recipes coming out of these great cookers you have. This turkey looks so delicious! You will find that statement pretty funny when you read my next post. You know me, the thing I find most tempting is that beautiful platter of your grandmother’s. So sweet. This looks amazing Barb! I’ve always wanted to try frying a turkey but have always been afraid I’d burn down the house and/or kill someone in the process. To be honest, I think I’d be too nervous to try it inside but you sure do make it look and sound easy. Can you send over a slice? OMG, that turkey looks mouthwatering! I’ve never had deep-fried poultry, but I would really like to try that way of cooking it. This looks like a phenomenal turkey!